Well intentioned, honest people also seem to have poor memories regarding historical events. It was a very, very snowy winter last year where I live, and a number of old timers made comments about how we used to always have snowfall like this. So I looked up after the season ended and it was by far the most snowfall since records began in the '50's and about double the historical average. And furthermore, most of the highest snowfall years have been in the last 10-15 years. I did some statistical analysis on the probability of two unusual events that have recently happened. We could quibble about the assumptions of random and independent events, but any discussion on that issue should make my point even more dramatic. First, the probability of being hit by two Category 4+ hurricanes in one year is once every 49 years. Given our length of record keeping, we could expect to have recorded that occurrence 3 times. (BTW, in its history Mexico has been hit by two Category 5 hurricanes in one year. One from the Pacific side and one from the Atlantic side.) 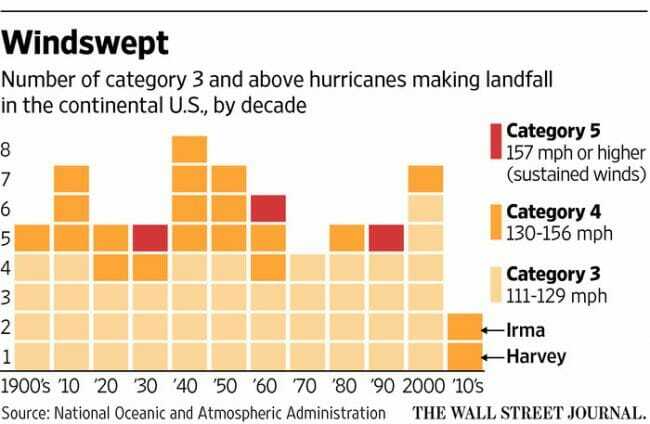 Meanwhile, the probability of going 11 years without being hit by a Major Hurricane is once every 540 years. That is extremely rare, and I do not expect to see it again in my lifetime! Of course, mainstream media is all aghast at higher probability actually happening, meanwhile virtually ignoring the rarest of hurricane events.